Display several pages at once without MasterDetailPage? Is there any way to display more than one page at once without using a MasterDetailPage? 'TabbedPageSample.Views.ContentPageBlueView' cannot be converted to type 'Xamarin.Forms.View'. I've also tried to use a Grid instead of a StackLayout, but it gave me the same result. 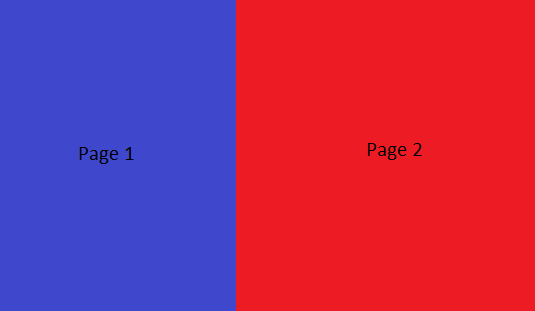 I've attached an image of how I want to show two pages next to each other. As far as I understand my problem, it doesn't work because I want to add pages, not views. my approach with a StackLayout or Grid works with views, but that's not what I want. In that case you need to re-think what are you doing: The Page is watewer you are showing on the screen. When initiating the page you set its content as : Content = yourView. So - You cannot have 2 pages on one screen - only 2 views. Want to ask - why you need pages over views? @DerProgrammierer - If you create ContentPages as if one were going to be displayed at a time, you can simply grab the ContentView and then embed that View value into your composite page. Doing it that way allows you to switch between a single page and multiple pages whenever you want. Create as many ContentPages as you want and then combine them that way. That is easily done. What takes more effort is routing what would have been overridden methods such as OnAppearing, OnDisappearing, through to the corresponding views in the composite page, as well as handling toolbars, back button etc. I don't need pages over views, but now I have pages instead of views available. 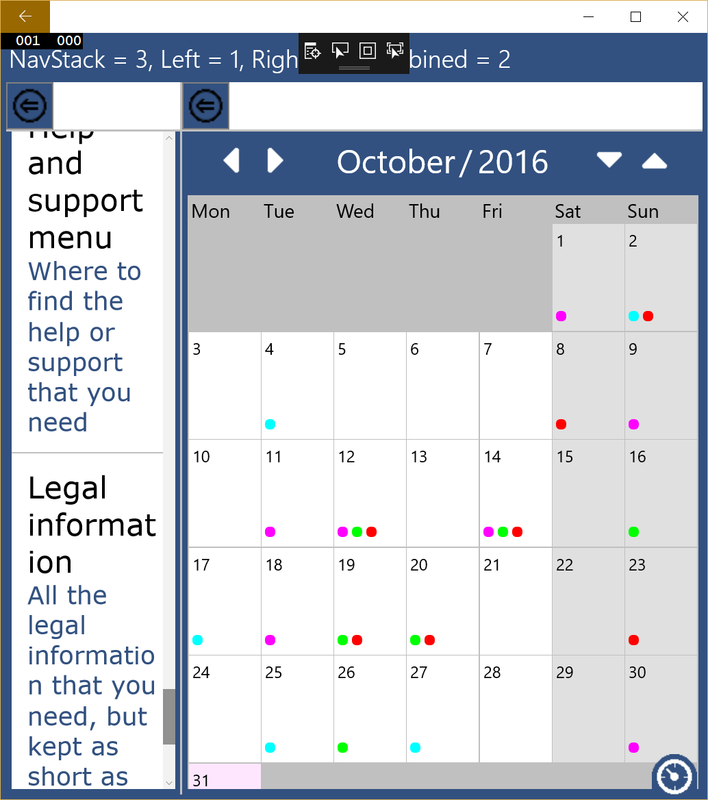 I'm new on this team and I'm implementing the UWP version of this app. I'm displaying only one page at once in phone mode. But in tablet mode (or UWP: Desktop mode), I want to show two pages next to each other because it makes sense in my app when I have more space (which is the case on a tablet). This also works on iOS and Android when using MasterDetailPage, but for some reason there are strange things going on when I'm using the same implementation on UWP. So far I spend a lot of time trying to fix this but I just couldn't come up with a solution, so now I'm trying to find another solution for UWP. I think you can use content view for phone and tablet. On phone you can hide and show one contentview at a time. 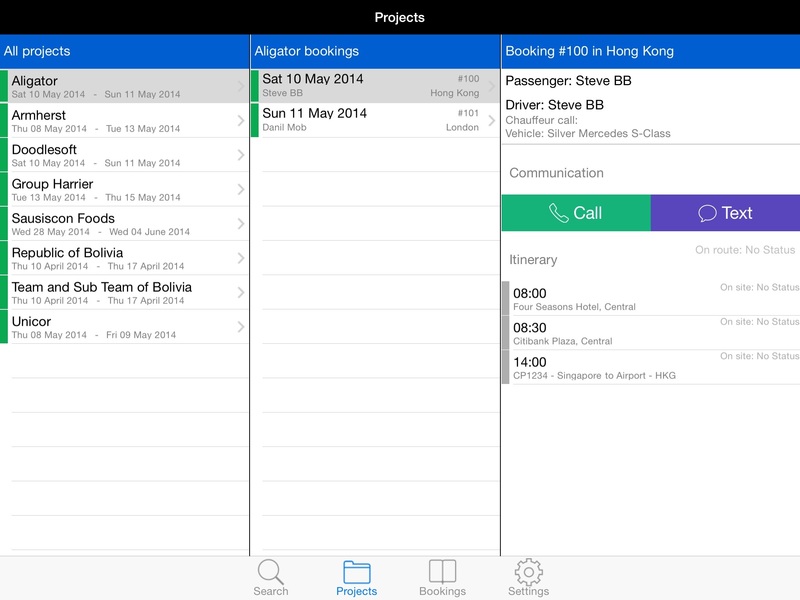 In tablet you can show two contentview at a time. Seing your answers, it's exactly what I'm trying to achieve but I just don't know how to achieve it. How can I make sure the ContentView instead of the ContentPage is used as a parameter? Do you have any sample code so I can change my code? @DerProgrammierer I dont know how masterpage is behaving on Windows, but from what you posted you using masterpage for iOS and Android. Why not to use it for WP too? if you insist on having ContentPages over MasterDetailPage the easiest but not elegant option would be to have instances of Pages and instances of ContentViews and use one or another when needed. It is clearly the repetition of code - but i cant think of only this at the moment. People seem to have different results even with the sample project I provided, so I assume there is a bug somewhere in MasterDetailpage or possibly Prism, but so far no one could figure out what exactly the problem is. The workaround is also not working because the "Content" I need to display on the left side of my StackLayout/Grid is a TabbedPage This whole issue is driving me crazy! @DerProgrammierer , I have this exact same issue. We have a paging system that currently works well. It just so happens that on desktop, I have plenty of horizontal real estate, so I want to slap two pages side by side. Unfortunately, I can't because of XF's object model design. XF should never have bifurcated View/Page in the first place. A piece of UI is a piece of UI. None of the other platforms like UWP, Silverlight, WPF etc. have this bifurcation, or enforce it strictly. As mentioned above, we can have two views on screen, but that means breaking the content of all our existing pages out in to views which will waste a tonne of time. We just want two pages side by side. Why is that so hard?